Even if you don't watch Game of Thrones, odds are you've heard of the massively popular HBO show. 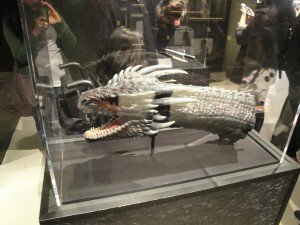 The show has gotten so popular in fact, that they created a touring exhibition to showcase the incredible costumes, props, weapons, and other goodies from the fictional world of Westeros. The event is in its third year. It tours around the world to 8 cities, including Toronto, to mark the beginning of each new season of the show. The exhibition has been a resounding success, attracting hordes of fans every year. And one of the best parts of this event is that it's absolutely free! You heard me right. The exhibition is a ticketed event, but those tickets are given away online on a first come first serve basis. Tickets are attached to a half hour time slot over the course of the 4 days the exhibition is in town. You choose your time slot and how many tickets you want (4 per person limit) and then go! The fandom for Game of Thrones is so fervent that they could easily charge for such an event and it would probably still sell out, which makes it even more amazing that they don't charge attendees a dime. My friend and I had the opportunity to attend the exhibition when it came to town on May 14. This had been my first time at the event and I was thoroughly excited, being the huge Game of Thrones fan that I am. This year, the exhibition was held at the TIFF Lightbox which, if you haven't been, is a spectacular building with beautiful architecture and wide open spaces inside. The first thing you notice when lining up is the Iron Throne of course. For the uninitiated, this is the throne from where the king or queen rules Westeros. One of the biggest draws of the event is the opportunity to not only admire the throne, but to sit on it and have your picture taken. It's amusing watching all the people put their own personal flare into their photos by posing in different ways. Some throw their legs over the armrest. One gentlemen, posed with his own harem of girls behind him. As you enter through the doors, you're immediately struck by how much it resembles a museum exhibit. Hell, if you know nothing about Game of Thrones you might think you're stepping into the medieval section of the ROM. It's a relatively small space, but everywhere you look you see precious artifacts from the show. The walls and columns are decorated with banners from the great houses of Westeros. The costumes are amazing. The detail is so intricate that you'd think they were real clothes from medieval Europe. The weapons are equally impressive. The only downside is, unlike the Iron Throne, you can't touch any of the props or costumes. The props not only encompass the weapons used in the show, but also goblets, jewellery, dragon's eggs, and even a replica of a baby dragon! All this is great, but the highlight of the exhibition was definitely the Oculus Rift. For those who don't know, the oculus rift is a revolutionary virtual reality headset soon to be released to the mass public, but currently not available to purchase. It's the most realistic virtual reality ever created outside of maybe a theme park ride. At the back of the exhibition are a set of wooden cages. In each of the cages is an oculus rift headset. The simulation allows you to ascend the famous ice wall from the show and look over the edge of the world. It's pretty impressive. As the elevator ascends the wall, you can look in all directions and see everything; up, down, left, right. The world is fully realized and you feel like you're in it. They even set up fans to blow cold air at you so you feel like it's really winter. Peering over the top of the wall is scary to the say the least. It's not unlike the glass floor in the CN Tower observation deck. The whole simulation takes about 30 seconds, but despite how short it is, it's thrilling nonetheless.